Would Automatic Voter Registration Increase Turnout? : It's All Politics A new law in Oregon is designed to make voting easier. Advocates are looking to it to increase turnout, but that might not necessarily be the result. Oregon Gov. Kate Brown smiles after signing an automatic voter registration bill on Monday in Salem, Ore. Seventeen years after Oregon decided to become the first state in the nation to hold all elections by mail ballot, it is taking another pioneering step to encourage more people to cast ballots, by automatically registering them to vote. Go to renew your driver's license in Oregon, and you will now be signed up to vote automatically. It's the first state in the country with that sort of law, which is designed to make voting easier, and stands in contrast to the trend seen in the past several years in more conservative states. "It's really interesting — when we've seen restrictions emerging in Republican-leaning states," said Michael McDonald, a University of Florida associate who tracks turnout as head of the U.S. Elections Project. "In Democratic-controlled states, we're seeing laws intended to expand the electorate." Colorado, for example, like Oregon is all vote-by-mail; Vermont is considering automatic registration, McDonald said, and a Philadelphia politician on Tuesday proposed the same for Pennsylvania. New York and Maryland, meanwhile, have expanded early voting. In Oregon, the law could swell voter rolls by hundreds of thousands. If other states follow suit, it could have a dramatic effect on the U.S. voting process. "During the testimony on the bill, a legislator said to me, 'It's already so easy to register — why would we make it easier?'" Oregon Gov. 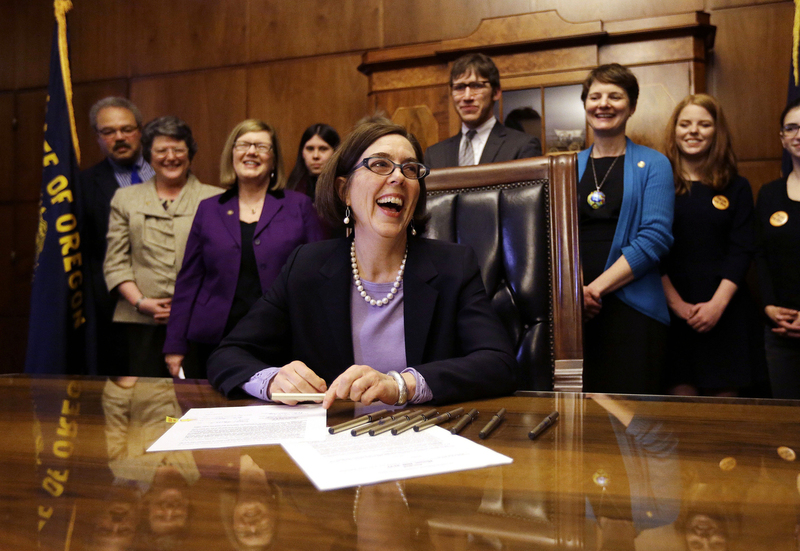 Kate Brown said during the bill signing Monday. "My answer is that we have the tools to make voter registration more cost-effective, more secure and more convenient for Oregonians, so why wouldn't we?" "The bill passed along party lines earlier this month, with Democrats largely supporting it. Republicans who voted against the law say they're worried about data privacy when the [Department of Motor Vehicles] sends information to elections officials." McDonald doesn't find that argument compelling. "You're already in the DMV database," McDonald said. "They're just registering to vote at the same time; you can still opt out." The "opt out" provision is key to the law. If someone does not want to be signed up, they have 21 days to let the state know. Many other states offer the chance to register to vote when someone renews their license or gets a state identification card, but those citizens have to opt in. Can States Go Beyond Federal Law On Voter Registration? Advocates believe laws like Oregon's are key to increasing turnout, but not all experts agree that necessarily will be the result. "It's likely we're going to see more people on the voter registration rolls," McDonald said, noting that some states with same-day registration have seen increases of 3 to 5 percent. But he cautioned that "the effect might not be as dramatic in presidentials" when there is "no need for the reminder" to vote. The real impact might be on state and local elections, when voters previously were receiving little to no information. What's more, McDonald said, when Canada implemented a similar system in the 1990s, only 1 to 2 percent of people opted out, but voter turnout didn't increase. "Canada moved to universal voter registration, and turnout dropped," McDonald noted. "Maybe it would have dropped further, but this [laws like Oregon's] is no guarantee."